This crew is getting ready to start shipping logs. The loader hasn’t arrived yet. The skidding crew is getting trees to the processor. The processor is making logs so there will be enough to load the trucks first thing in the morning. I don’t usually get a shot of the processor working by itself without the loader parked beside it. The 60 Second Forester is the name of a series of spots done by good friend and fellow forester, Frank Barron. They were originally radio spots done for the local Northern California airways. Now they’ve been remixed for short videos. Enjoy! Auction Results … HOLY CRAP! 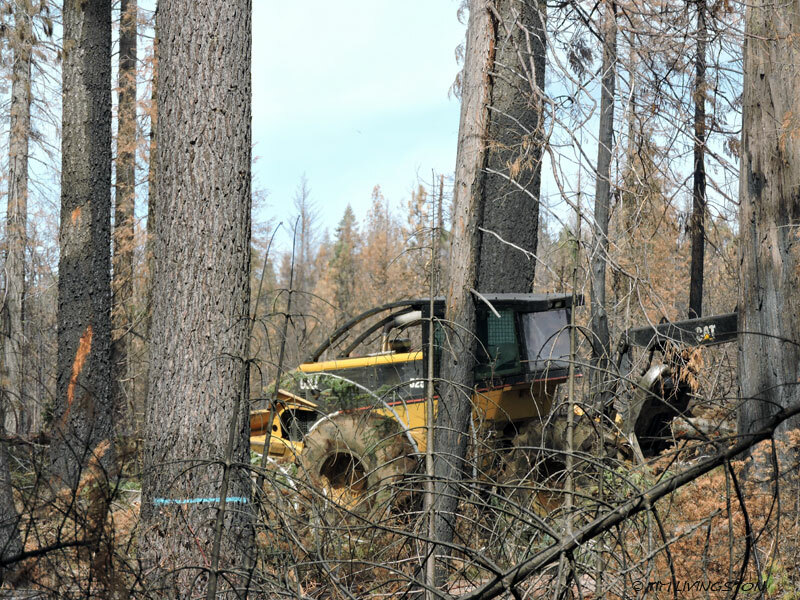 The Sierra Cascade Logging Conference is all over, but for the clean up. 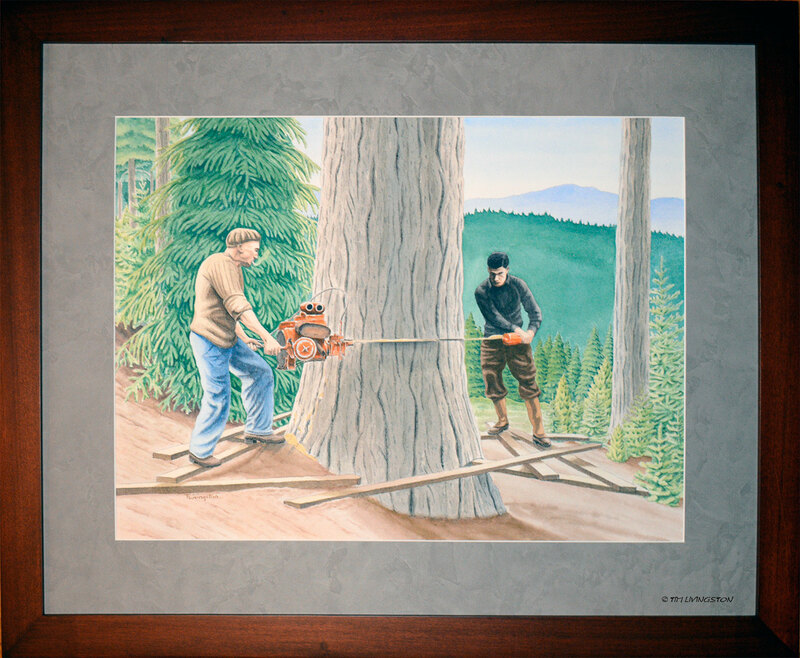 The Forestry Education Fund Auction was last night and it was a booming success. The final result of the entire fund-raiser was north of $100,000. Now if you’ve been following our blogs, you know that Mary (Sneaking Bliss) and I provide original art, which is bid in a competitive way. Both pieces of art are on the auction block together. The winning bidder gets to pick the painting of their choice and then bidding begins anew on the second place painting. Here’s how things went down. Our paintings were items 18 and 19. This is a great place to be on the schedule, the early middle. There were fifty items to auction. Everyone was still there with plenty of money left for bidding. When our turn came they asked us to come up front and say a few words, but this auctioneer was a total pro. I didn’t have a chance to needle Mary with my witty comments when the auctioneer jumped right in and was talking so fast I could hardly keep up. The first bid opened at $1,000. This was a great start! Within seconds it shot up over $4,000. As it went above $5,000 things really got serious. A new bidder jumped in and one bidder got out. Then another dropped out and it looked like we had reached the end. Suddenly, the last bidder to drop out decide he wasn’t done and the bidding took off again. As it shot up to $7,000 then $8,000 I leaned behind the auctioneer and looked at Mary and she look at me with “what is happening here” looks on our faces. The auctioneer finally yelled “SOLD” and the bidding was done. One of our paintings just sold for $10,000! I was floored. Now the moment of truth. The winner came up to claim his prize. We waited to see which painting it would be. Do you think he agonized over which painting to choose? Heck no! He beelined straight to Mary’s painting and snatched it off the display like he was rescuing a baby from a fire. 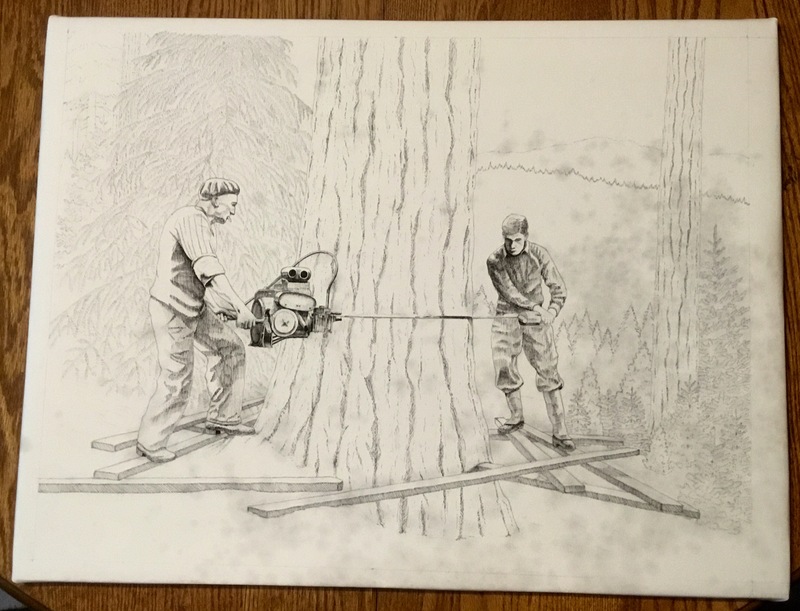 Mary’s painting brought in $10,000 in support of forestry education! It was an amazing moment. 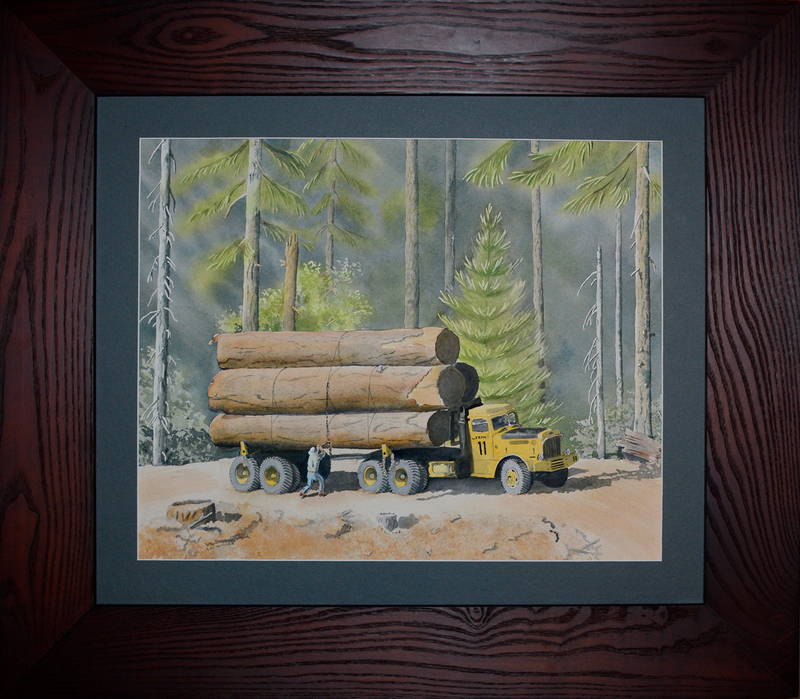 Off Highway Hauler, the winning $10,000 painting by Mary A Livingston. At this point my painting was back into the bidding and the auctioneer began searching for a new price. Long story short it fetched $5,000. Don’t get me wrong, this was a fantastic price. Higher than I’d seen before, but … she crushed me! Mary absolutely annihilated me! Together our art brought in $15,000. We were thrilled at its success and what it meant for the education fund. Tonight I’m going to relax, lick my wounds and have a toast with my favorite competitor. Tomorrow will be soon enough to start thinking about redemption for next year. Congratulations Mary, you are an amazing artist! Just a quick update on the painting for the auction. I’ll have it wrapped up tonight to make it into the auction catalogue. Here’s my progress. I’ll be back here tomorrow with the finished product. Now back to work! 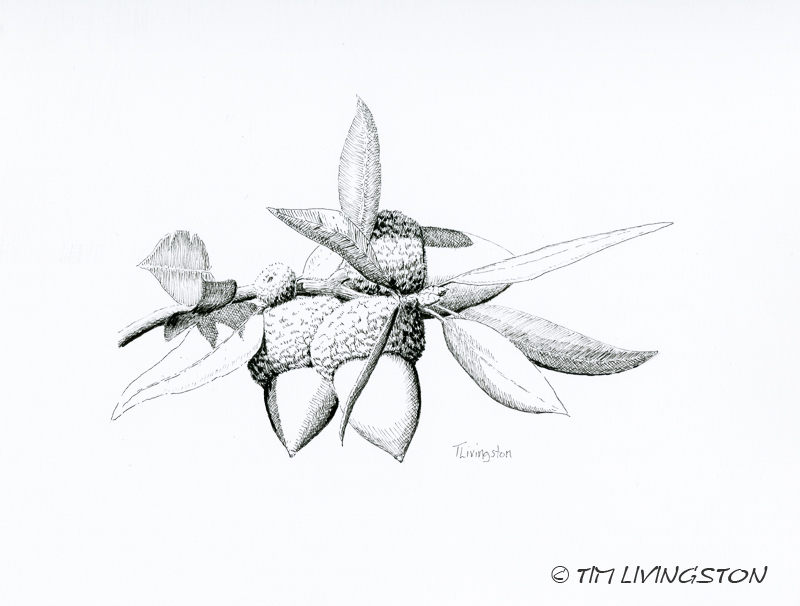 Canyon Live Oak acorns in pen and ink. Canyon Live Oak, Quercus chrysolepis, is an evergreen oak of the California Sierra Nevada and Coastal Range. Its full range stretches from Mexico and Arizona north to southwestern Oregon. These trees typically prefer shallow soils like those found in steep canyons common in the low and mid elevation mountains. Hence the name. These sites are normally poor soil quality and aren’t the best locations for growing commercial timber. Canyon Live Oak is not considered as a commercial species. Its main commercial value is as firewood. However, it has a high intrinsic value as a species important to wildlife. In forest management it is far more beneficial left on the landscape providing food, nesting and roosting habitat. The camera wasn’t crooked. A canyon live oak in a canyon. This specimen is over 4 feet in diameter. Acorn woodpeckers use the canyon live oak acorns as a food source. Black bears eat mass quantities of acorns in the fall. So do the black-tail deer. Skidding salvage logs to the landing in the King Burn. This article appeared in The Economist and sums up the need and benefit of thinning the forests of the Sierra Nevada. I’ve added a few comments about it below. The larval form of bark beetles are what kill the tree. The adult beetle chews a nursery gallery into the tree and lays her eggs. The larva hatch and spread out from that gallery creating more galleries as they feed. 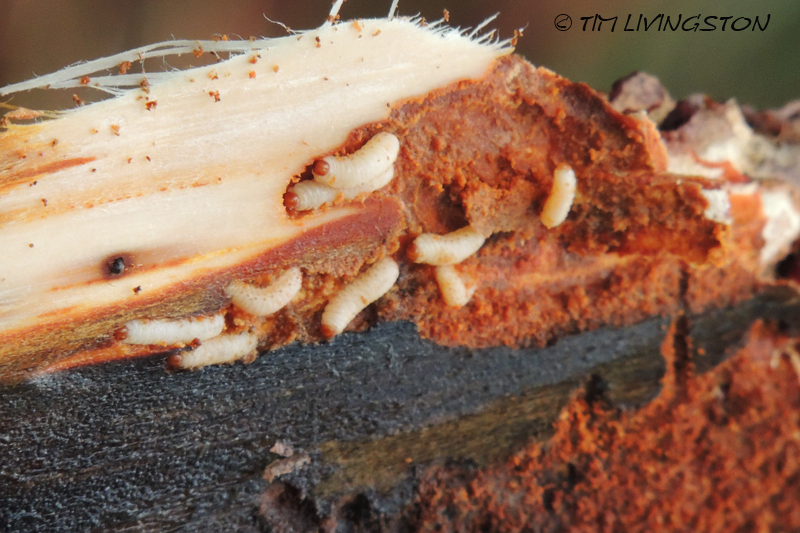 During this feeding process the larva girdle the cambium of the tree causing it to die. I really appreciate the discussion regarding water generation through thinning. I believe this is one of the least discussed benefits of practicing forestry in the West, but in California it’s one of the biggest benefits with our constant water deficits. Thinning the Sierra forests would generate an enormous amount of water for California. When comparing the cost of controlled burning to mechanized thinning (logging) you can’t ignored the cost incurred when controlled burns get out of control. The cost differences between doing controlled burn and fighting out of control fire is enormous. I’m not saying don’t use controlled burning, but fire suppression costs need to be included when controlled burns get out of control. Controlled burning is one tool available, but cannot come close to solving the problem of all the overstock forests. Commercial thinning that includes merchantable (larger) trees is the only economically sustainable way to accomplish the massive level of thinning that needs to be done. The author points out 52 trees per acre was the historic density of trees in the Sierra. Research has shown that the proper density for optimal growth in fully stock mature timber stands to be between 43 and 64 trees per acre depending on the size of the trees. If we remove 236 trees per acre to reach 64 trees per acre, then some of those trees have to be big enough to make a 2 x 4. 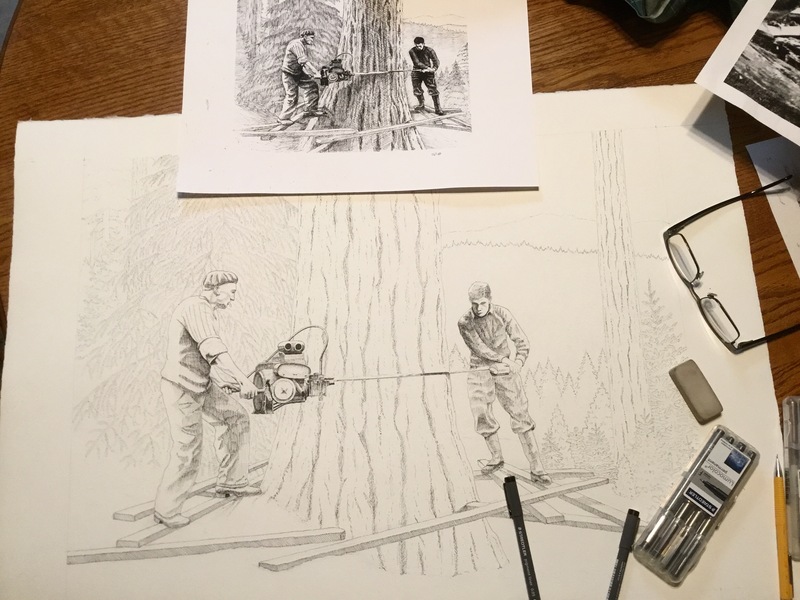 If there is enough value in the larger trees, a timber company will pay the federal government to thin the forest instead of the government paying a contractor to clean up and dispose of the unmerchantable trees. What’s the upside? We get healthy resilient forests that are more fire resistant. Wildfires that do start are less severe, and safer and easier to control. There is more water available to the state. The wood isn’t left to rot. It is used in wood products and to generate electricity. People doing these forest related jobs see an economic benefit, particularly in the rural communities. The practice is sustainable and wood is our great renewable resource. Lastly, some folks are going to fret over the impacts of logging at that scale. I want you to know this, timber harvests are studiously planned to mitigate the potential negative impacts they could cause. Secondly, just imagine the negative effects of these mega-fires. I’ve seen them and their effects are staggering. I’ve yet to see one large burn ever have it’s negative impacts fully mitigated. I just saw this op-ed from the opinion section of the Sacramento Bee. Once I finished banging my head against the wall, I decided it would make a good post. I don’t disagree with most of what is said here. In fact I’m heartened that this originated from the Lahotan Water Quality Control Board, one of the strictest WQCBs in the state. The problem has been that forestry professionals have been pushing solutions like this for decades and the WQCB has been one of the most resistant agencies regarding timber operations. So many agencies including the United States Forest Service have been stuck in the purgatory of “analysis paralysis.” for so long that the problem of overgrown forest has grown into a crisis. Plus, environmental groups seeking to shut down all harvesting projects have piled on. Our California forests continued to increase in density until another drought comes along, as is prone to happen here. The forests become stressed. Beetle population spike and huge swaths of forest are killed. Wildfires during red flag conditions become unstoppable. The impacts of these fires are exponentially worse than the impacts of the forestry projects that could be creating healthy, fire resistant forests. It’s good to see acceptance of a possible solution voiced in this article, but the damage is done. We closing the barn door after the horse got out. I wish we could have had this support twenty years ago before 102 million trees died. 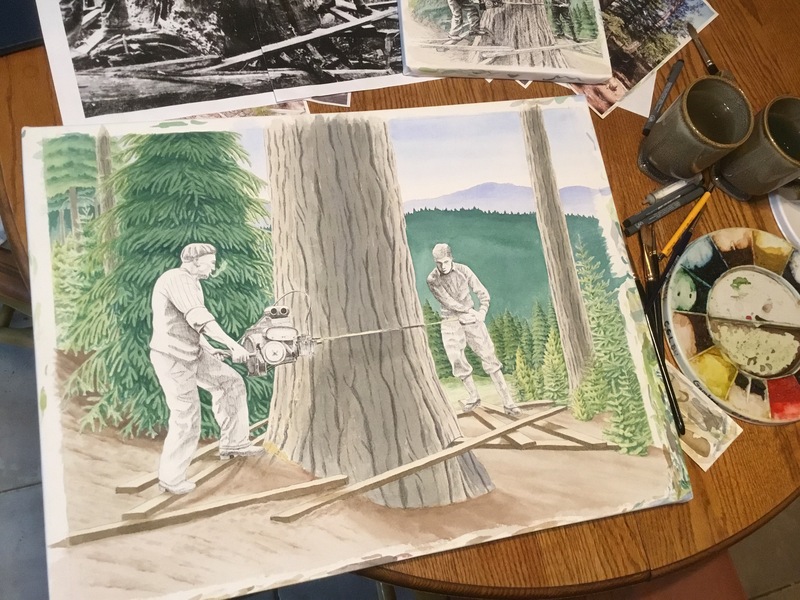 If the USFS follows its usual pattern of not aggressively salvaging dead and dying timber, only a fraction of a percent of the dead trees will be harvested. They will rot on the stump waiting for the next big fire. These trees are the property of the citizens of the United States. What a waste. As a public service to my fellow foresters and any interested civilians I present this video. Watch and you will see how to tell if your vehicle is stuck in the snow. It took about two hours to dig out. 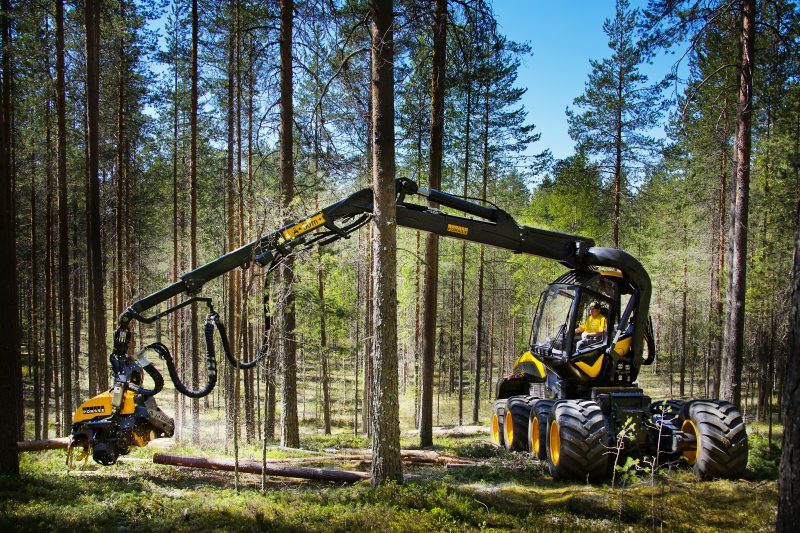 Mechanized harvesting has opened up huge opportunities in forest management. Such as allowing an economical method for thinning small trees. The forest health ramifications are enormous. This article shows how technology is taking forest stewardship to a whole new level. Good stuff from the Finnish Forest Association.